Contact Sykes at Ardagh North Cottage with Country Views on 01244 500 540 or complete the enquiry form. Enjoy the best of both worlds with a stay at this high quality 4 bedroom rural retreat, set next to unspoilt County Cork countryside, yet enjoying a location just 2 miles from the port town of Baltimore. Inside and outside this County Cork cottage is a real treat. The views out over the surrounding fields and farmlands are just superb and inside this property is furnished to a high standard. 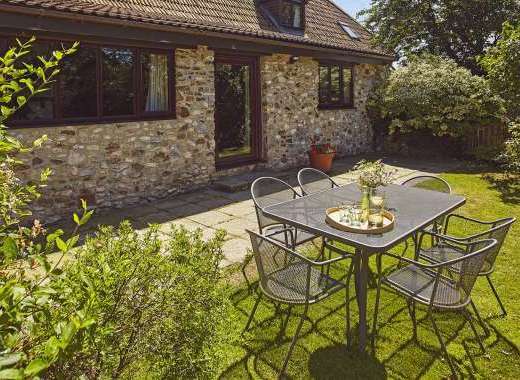 This charming rural country house offers comfortable and welcoming accommodation for up to 8 guests and all of the family can enjoy a stay here as one pet dog is welcome too. Inside the lounge with its comfy seating, open fire and TV is a great place to relax, the roomy kitchen is a great place to whip up a meal and the dining room with its woodburning stove is a great place to catch up altogether. There is also a utility room and a shower room with WC on the ground floor, plus one ground floor double bedroom. Upstairs are the three further bedrooms; one double bedroom with an en-suite shower room with WC, one twin bedroom, one double bedroom and the family bathroom with bath, separate shower and WC. With a wonderful rural location, a number of the rooms boast wonderful views over the surrounding countryside. One of the best places to soak up those wonderful country views is from the picnic table outside or from the garden. Also in the garden is a BBQ so you can enjoy al fresco living in summer time. Days out can be enjoyed discovering some of the best of the Western County Cork coastline and the ‘Wild Atlantic Way’ where the adventurous can enjoy activities such as sailing and windsurfing and even whale watching in season. It’s also possible to visit islands such as Cape Clear, Sherkin and Heir when in this part of Ireland. Also worth a visit is the nearby bustling town of Skibbereen which is only around 15 minutes’ away by car.